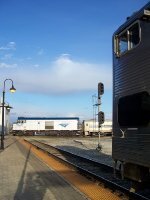 Description: Amtrak train P371, the Pere Marquette, arrives to the Padnos Transportation Center. Description: Cheap material being used for numberboards. Description: Who has the right number board above their pike? 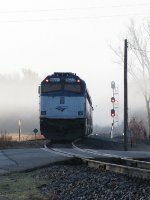 Description: The southbound Hiawatha arrives at the Milwaukee Airport station enroute to Chicago. 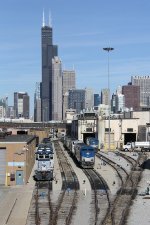 Description: Amtrak NPCU 90221 trails Lincoln Service 305. Description: Amtrak NPCU 90221 leads train 340. Description: Amtrak NPCU 90221 leads Hiawatha 338. Description: AMTK 90221 and 90224 sit with some other units in the AMTK terminal. Title: Train 338 "Hiawatha Service"
Description: Northbound #335 approaches Rockland Road. He will pull into the long passing siding to let #336 go south. Description: Amtrak #332 southbound Hiawatha. Description: Sitting along side the shops for Amtrak at 18th Street.